You want it unique, extravangant and love to distinguish yourself from the masses? Here youve found what you were looking for! Ltd Edition, best workmanship, premium class materials, copyright protected one-of-a-kind design for individualists! Item description: You want it unique, extravangant and love to distinguish yourself from the masses? Here youve found what you were looking for! Ltd Edition, best workmanship, premium class materials, copyright protected one-of-a-kind design for individualists! 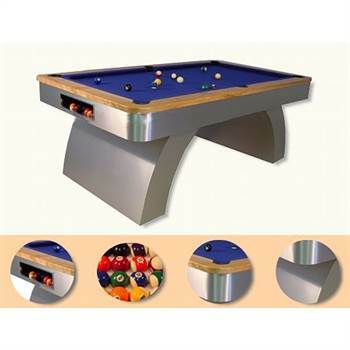 Design Poolbillardtable 7"(1/3) aluminum/veneer and oak in symbiosis of design & material with 1.9cm slate plate, covering from 100% wool, solid oak playing field edge, ball set, 2 queues, triangle, chalk etc.